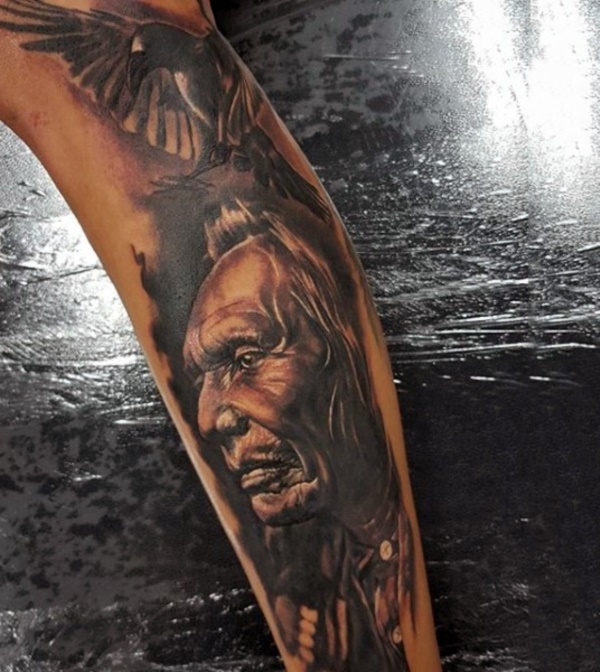 Native American tattoos come in a wide variety of designs and styles which either portray a Native American or their culture in some way. 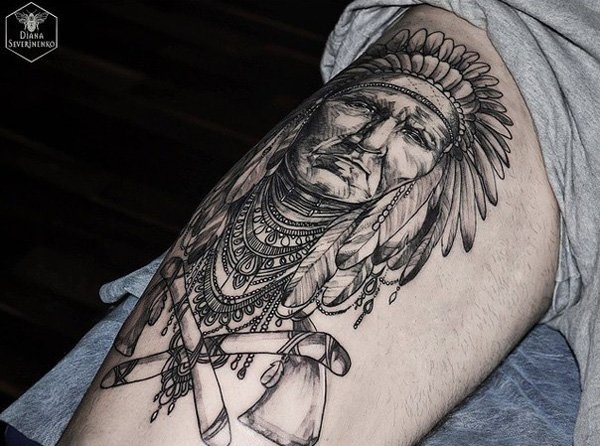 While some of these designs vary in style from American Traditional to Realism, they all take something from the culture and transform it into the design. 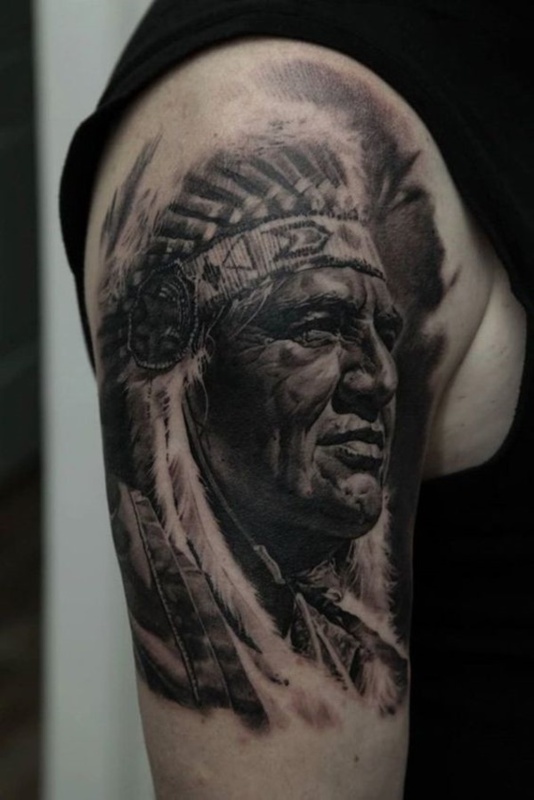 For instance, you will find Chiefs, Female Native Americans, Dreamcatchers, and even spirit animals represented or used as the designs for these works of art. 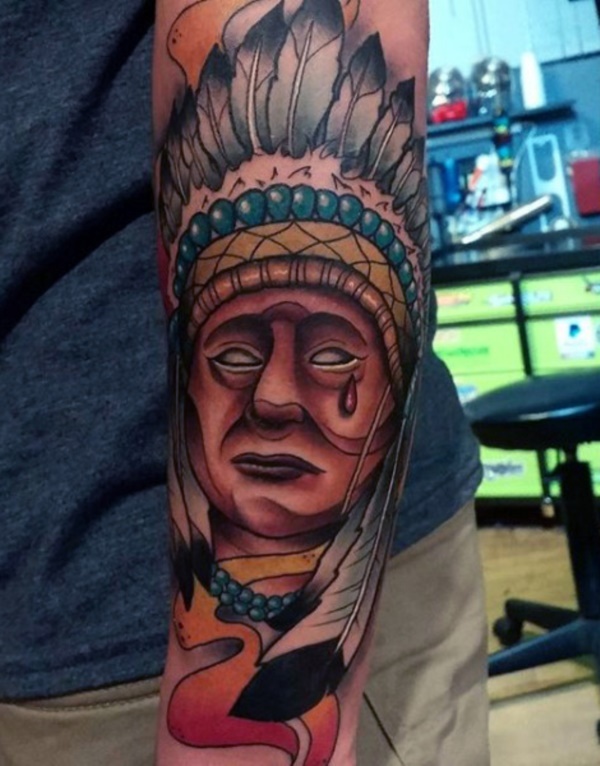 In this tattoo, you can see the brilliance of the American traditional style of colors as well as design is used to create the Native American chief. 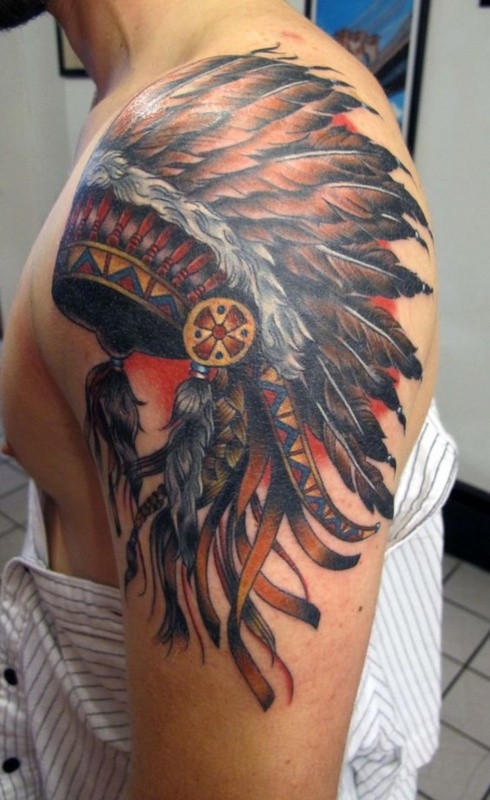 While designs such as these are common, the use of the headdress, in this case, is representative of the Native American’s culture. 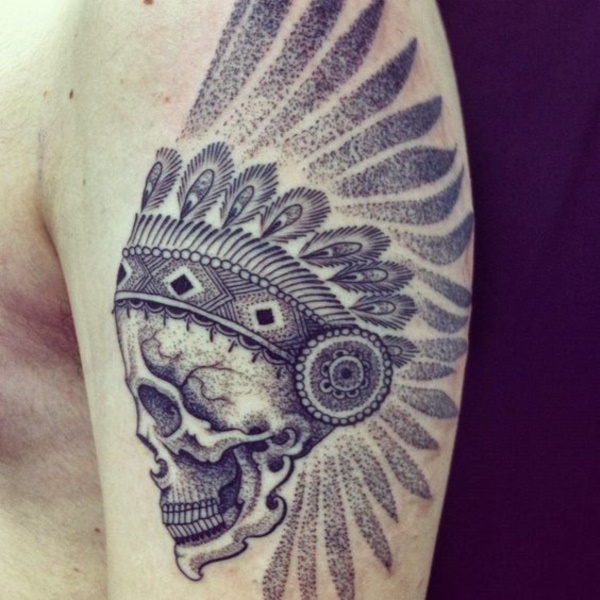 Many call these designs Indian skull tattoos, and the meaning behind these works of art may vary from person to person. 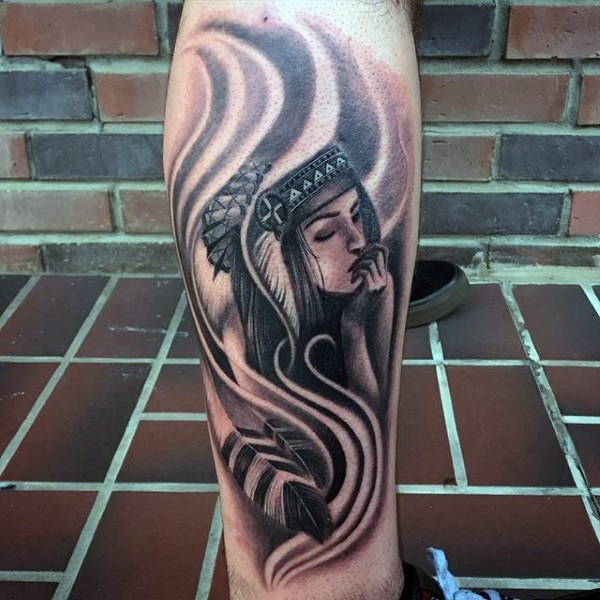 Many choose to gravitate towards female Native American figures in tattoo design as there is not only a beauty but also a strength to them that is unparalleled. 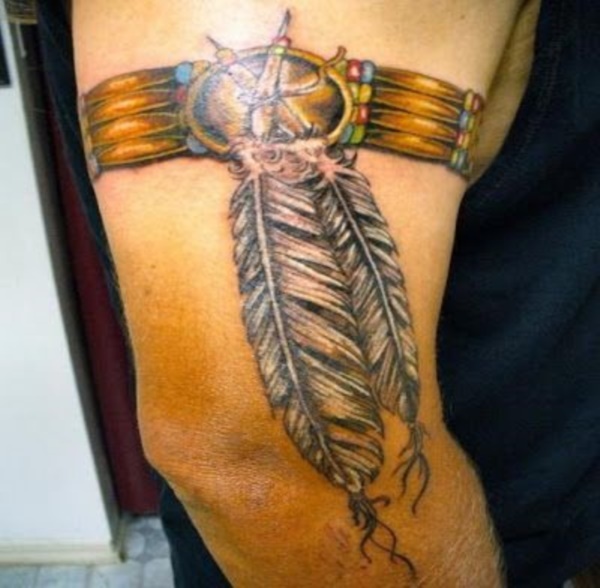 Dreamcatchers are a hugely popular as well as recognized part of the Native American culture as well as Spirit Animals, both of which are represented here in this design. 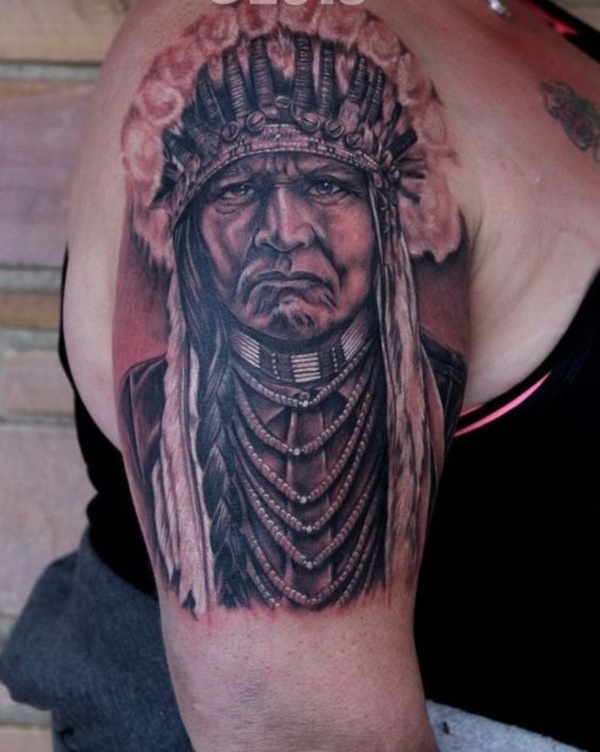 Realism in tattoos is an amazing option when choosing a design as there are many features that can be captured using this style, including the textures of the headdress and the expression seen on the face of the chief in this tattoo. 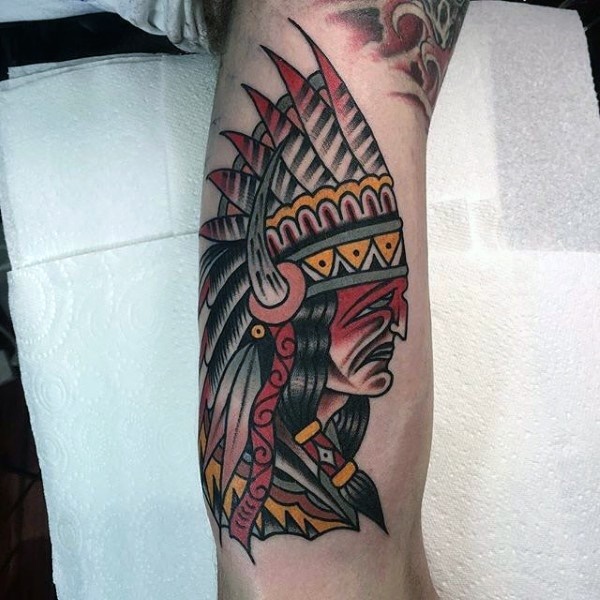 Having your works of art done in color can allow you to make them stand out against other designs like this chief. 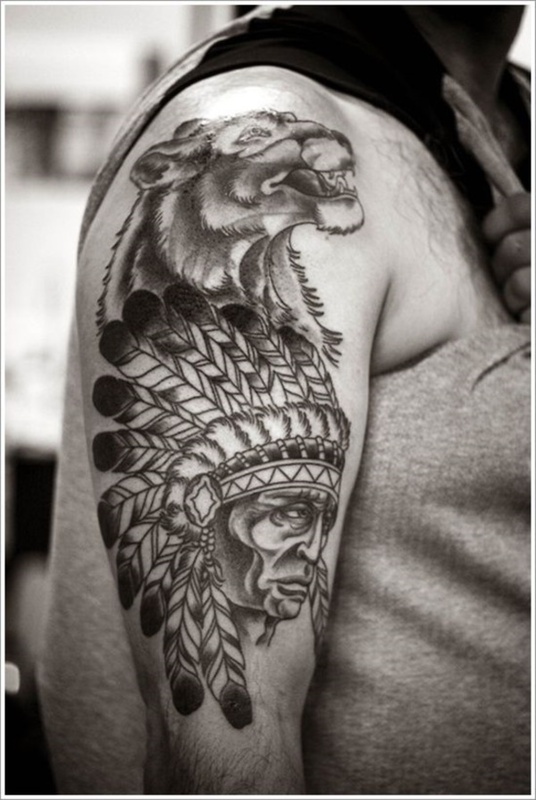 While most Native American designs show strength, some also possess other expressions which are heightened by the design and style used. 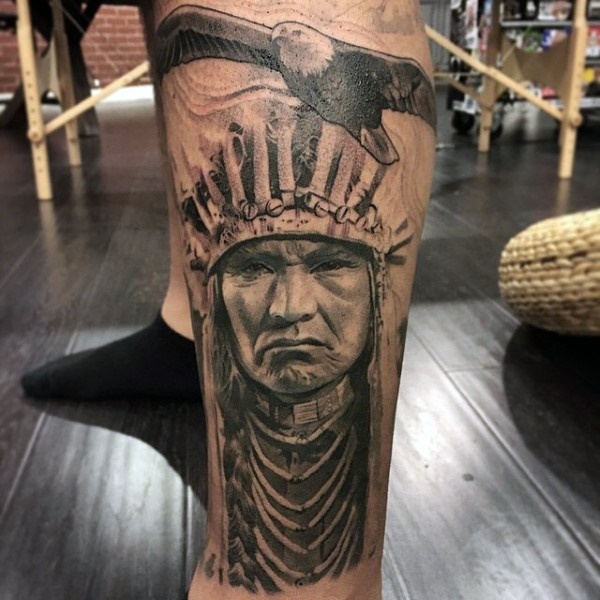 There are some that think of anger or war when thinking about the Native American people and how their chief led his people through with strength. 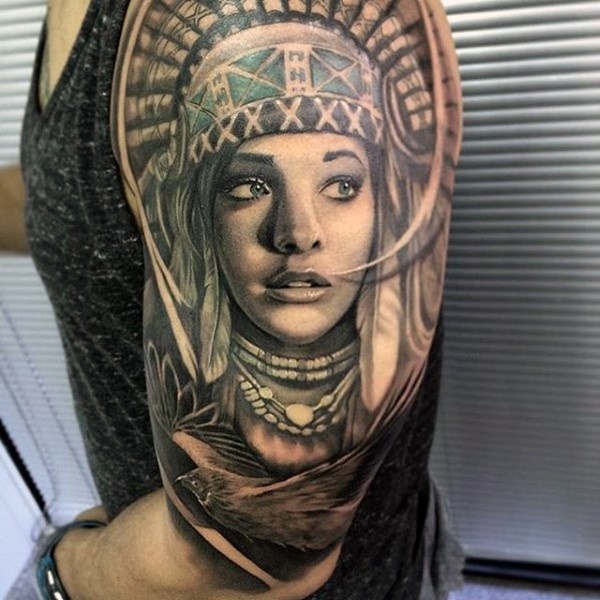 It is easily noticeable that the women tattooed in Native American style designs are beautiful and in some cases, they are depicted with a large headdress. 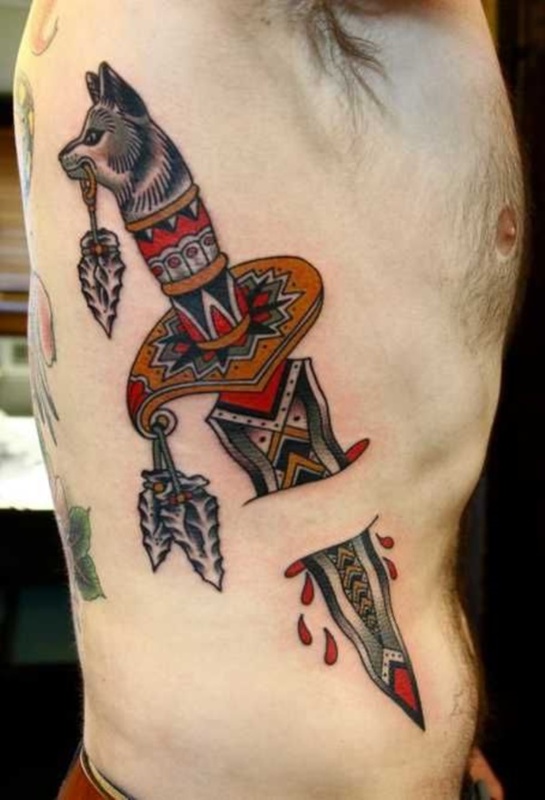 While it is not as common as other designs, others choose to possess designs of various weapons such as this dagger complete with arrowheads and a wolf. 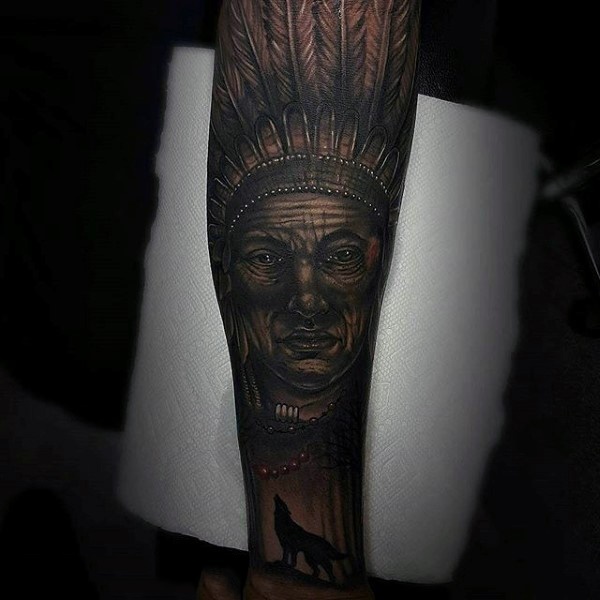 Some may disagree, however, the Aztecs and Mayans were also Native Americans and hence this design is added to our list in its beautiful realistic glory. 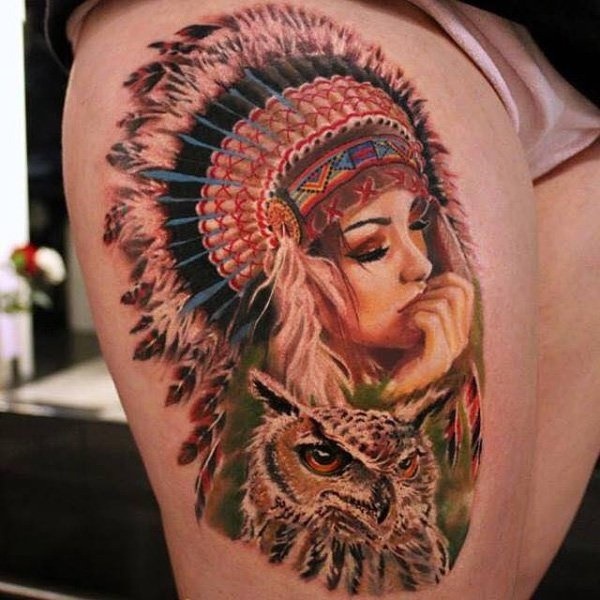 This is yet another beautiful example of Native American women tattooed wearing a headdress, although this one may represent a spirit animal. 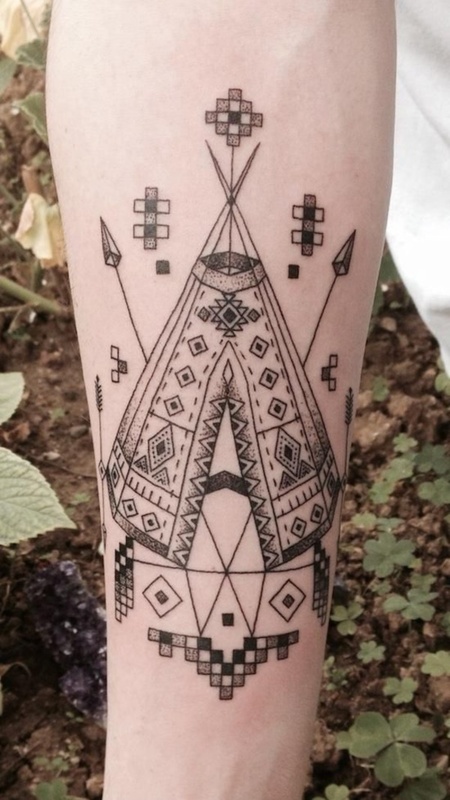 Teepees are another popular concept when considering Native Americans making them another popular tattoo choice as well as wigwams and various other housing styles. 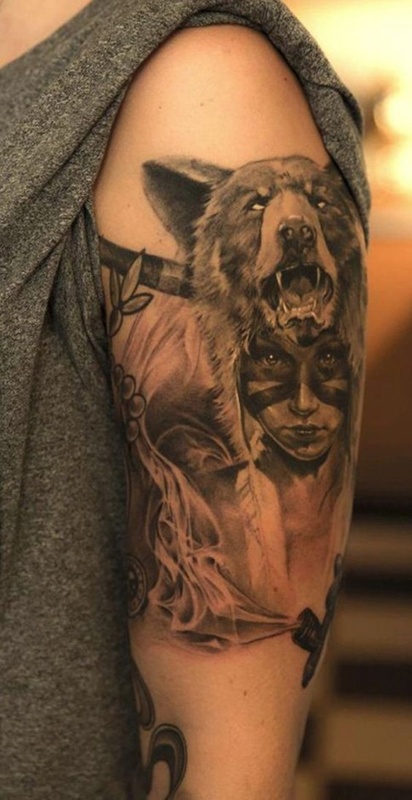 Animals were respected by Native Americans which is why they are a huge part of the culture and hence used in many Native American styled tattoos. 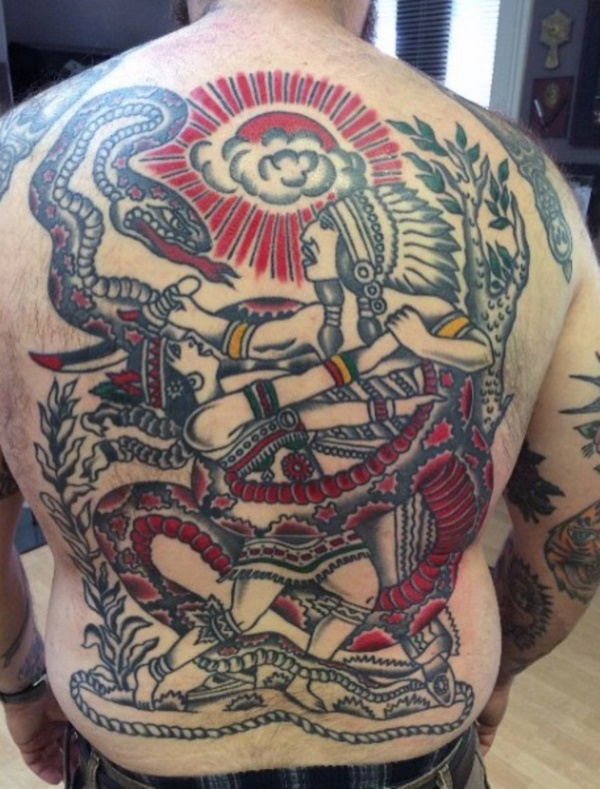 American traditional tattoos don’t have to be in color, although most will choose for this style to possess color. 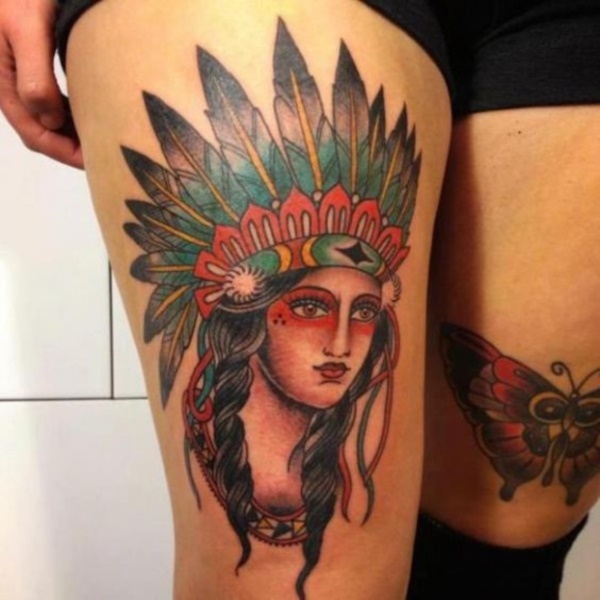 Here is another example of American Traditional tattooing of a Native American woman, although this one possesses the colors that have created the fame of this older style. 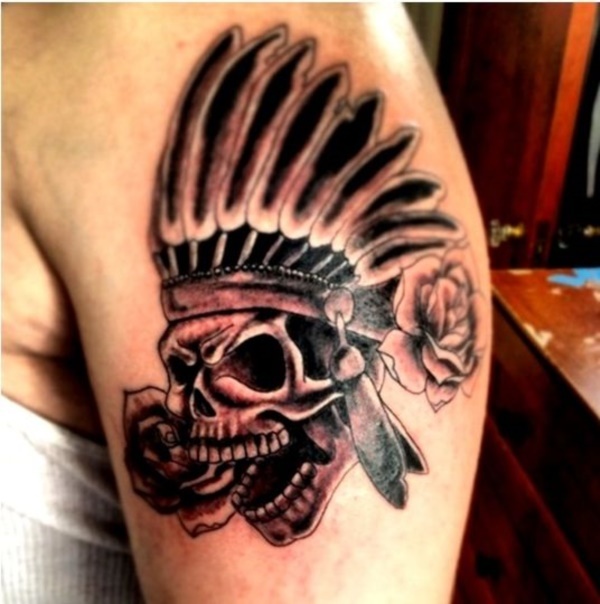 Native American skull designs can be done from a variety of angles including profile as seen below. There are a few folks out there that prefer to possess scenes or full images that tell a story such as this Native American hunting. 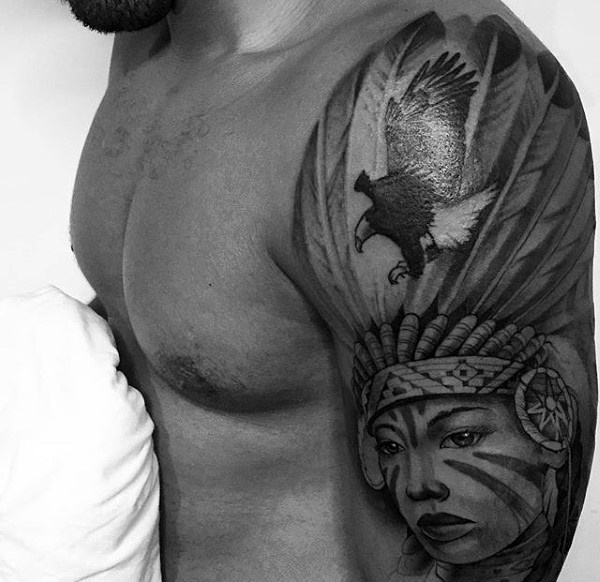 You may also see full sleeves dedicated to a singular Native American styled tattoo such as this chief and howling wolf tattoo. 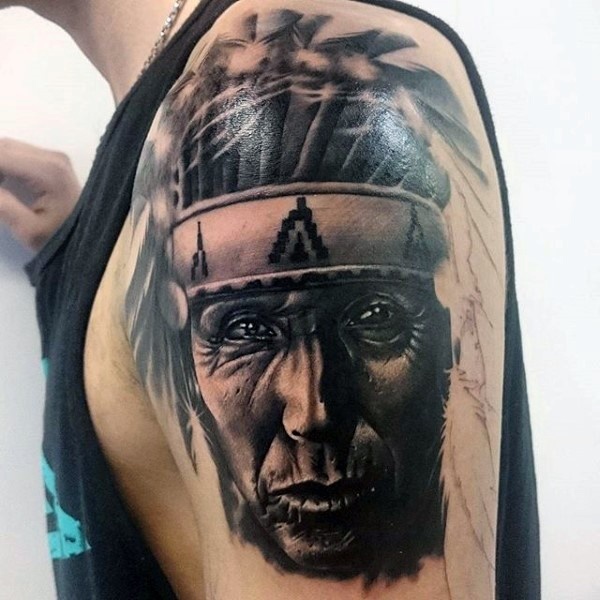 Native Americans are also known for their elaborate face paint which was done for ceremonies as well as symbolism before and after other events, meanings varied between tribes. 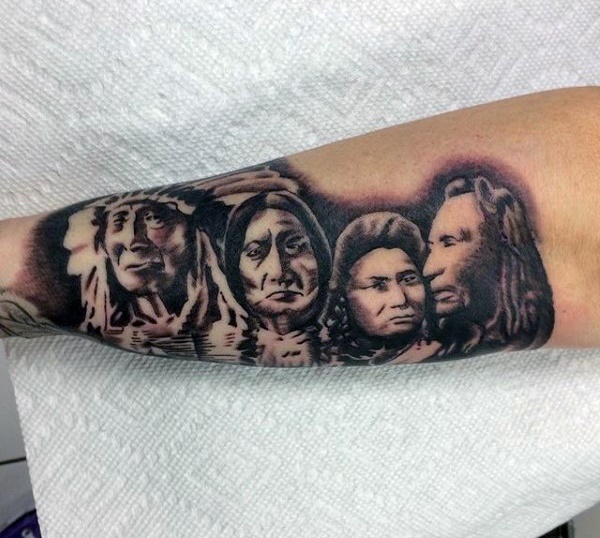 Popular with the Ojibwe people, totems were sacred and each totem told a story. 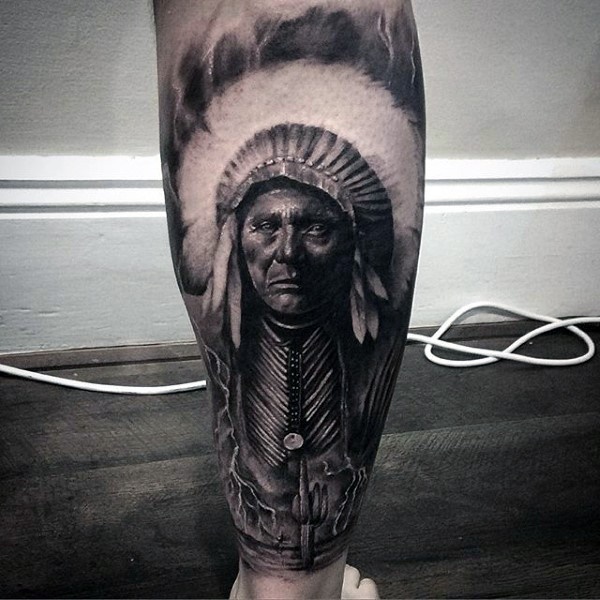 Today the designs used in creating totems are used as inspiration for tattoos. 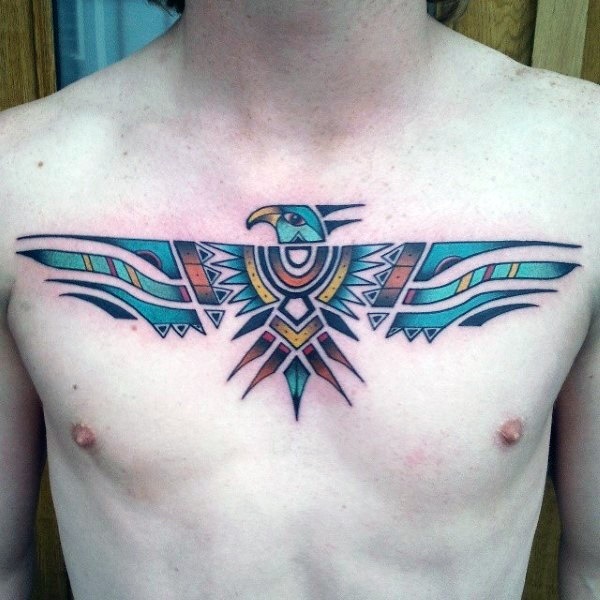 Each design is completely unique, however family was an incredibly important aspect of the Native American culture. 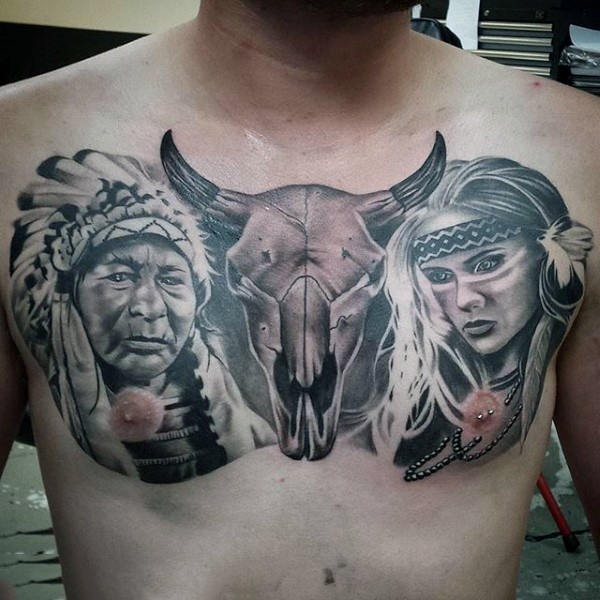 Chest pieces are another common sight when looking at Native American designs as it allows for more elements to be added to the design. Some designs are only semi-realistic and contain more flat details than full realism styled designs, though both styles are beautiful. 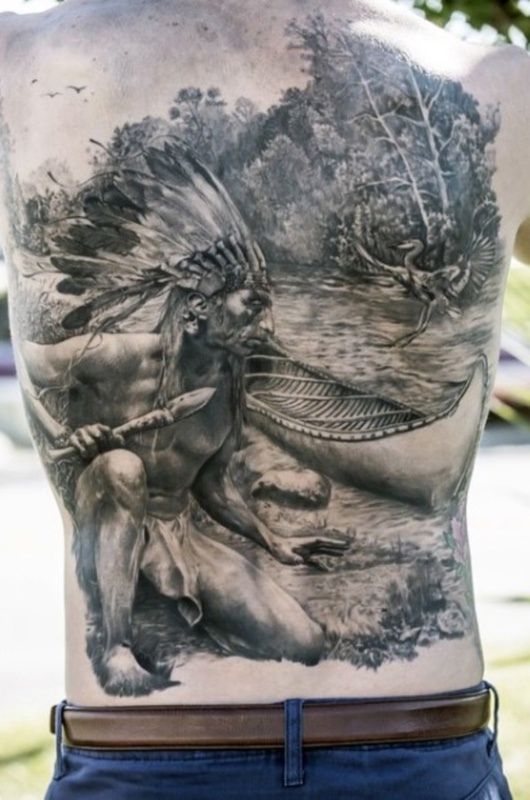 The chest piece below is likely that of a Chief and his daughter as both were seen as important figures within the tribe. Many styles look amazing in simply black and gray and can possess a higher level of detail without the use of color. 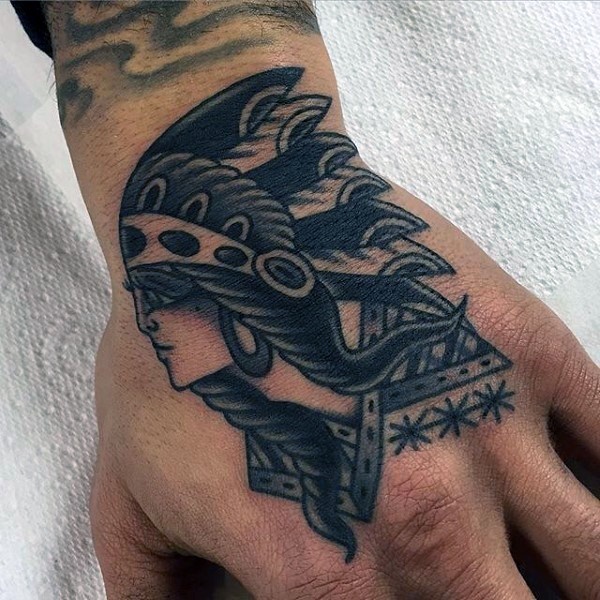 Aztec and Mayan women will generally differ slightly from other Native American tribe designs as they will have jewels on their headdresses instead of feathers and woven bands. 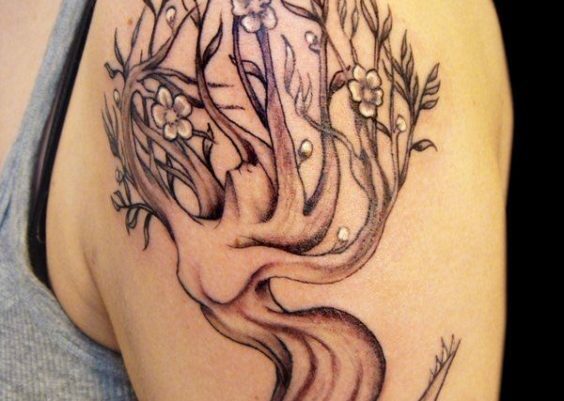 You may also find some designs will possess only a single color while the rest is in black and gray. 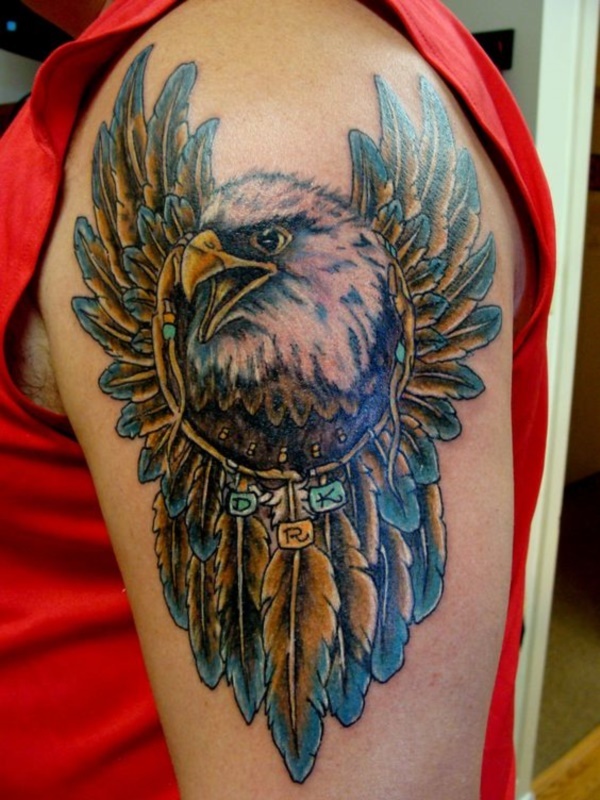 Since animals are a huge part of Native American culture, you will see many animals used in the designs whether they are a small trinket in the design or a huge element is up to you. 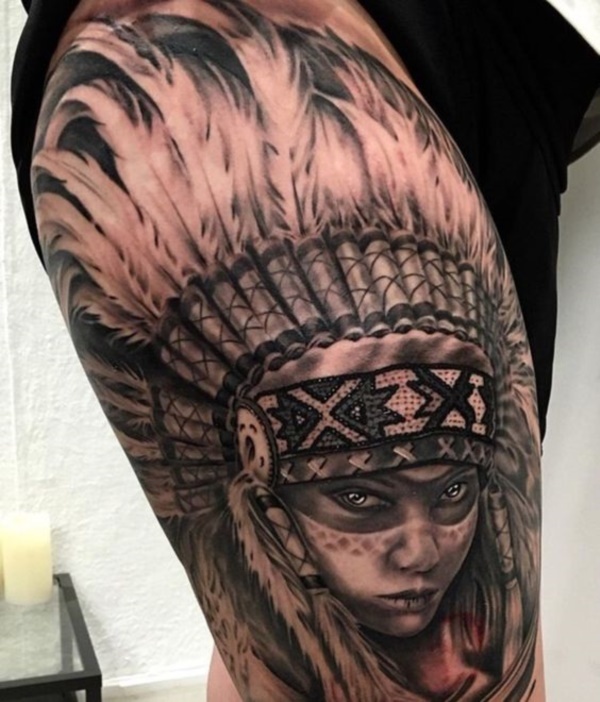 Some prefer to choose a singular tribe to represent in their art such as the Mohave and have them be the singular focus of the design. 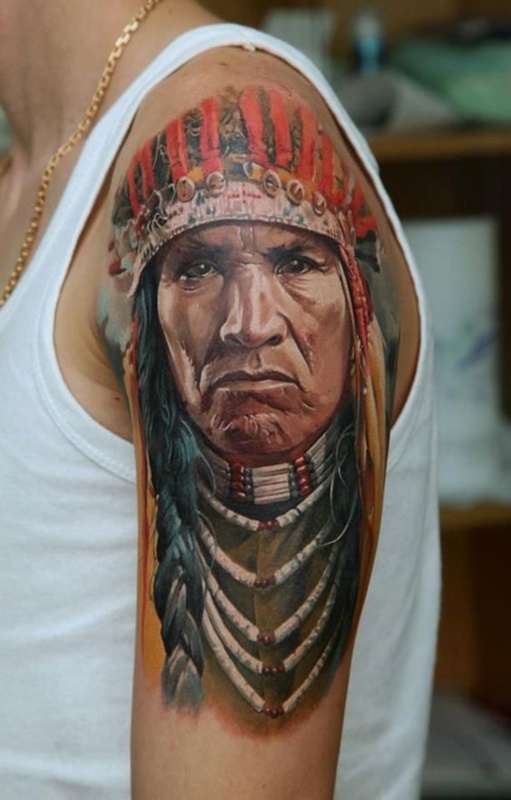 Most Chief tattoos are highly decorated with necklaces and headdresses as well as some possessing face paint and weapons. There are some scenes that feature feats of heroism where one Native American is battling a great danger to save another, usually a woman. 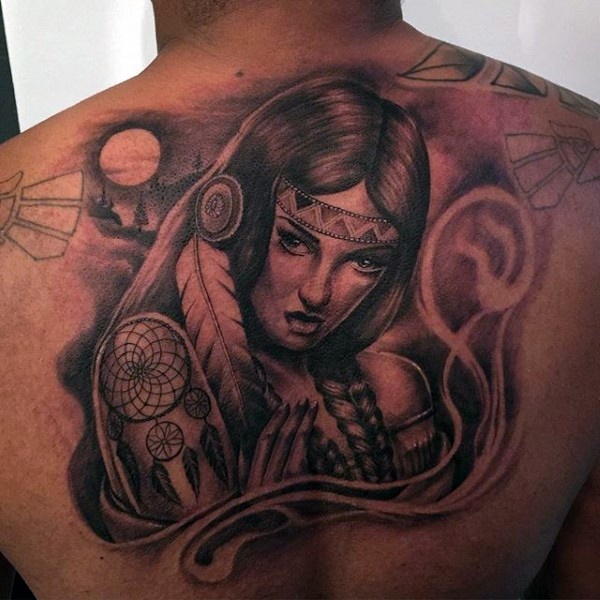 If you choose a design that is full of color such as this Native American woman, keep in mind that they look best when shading and other elements are included that will highlight the design. 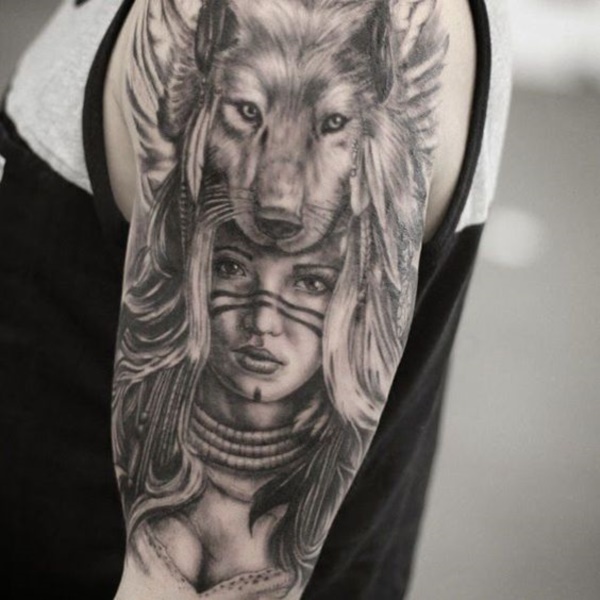 Many Native American women are depicted with braids in their hair along with feathers and headbands, however, the addition of tattoos creates even more interest in the design. 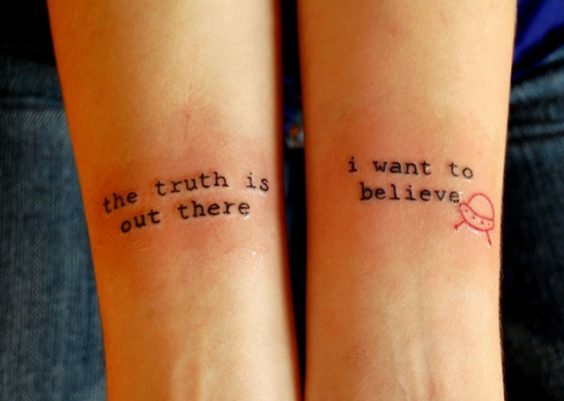 Some tattoo styles look more like sketches than simply black and gray as they use far more white space in the design. There are many other art styles out there that offer a softer look to them as if they were painted using oils or watercolors. 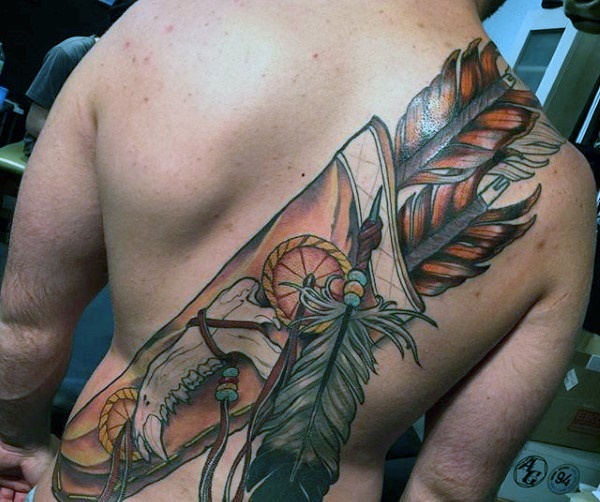 Like the dagger tattoo, there are some that prefer the designs that feature Native American weapons such as this quiver of arrows. 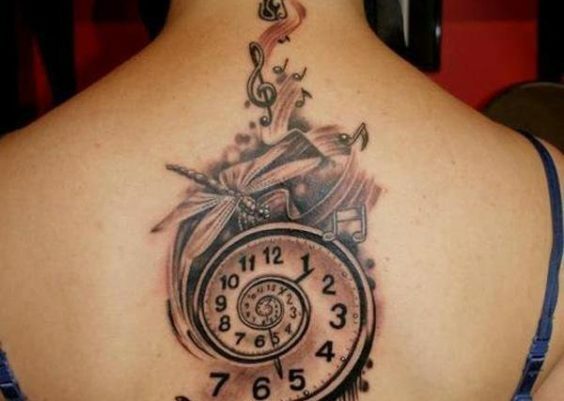 Some designs are done using dark black ink as they tend to last longer over time as the fading usually enhances the shading that was applied. Darker designs also appear more detailed as the darker sections offer a brilliance to the highlights that would otherwise possess a less prominent gradient. 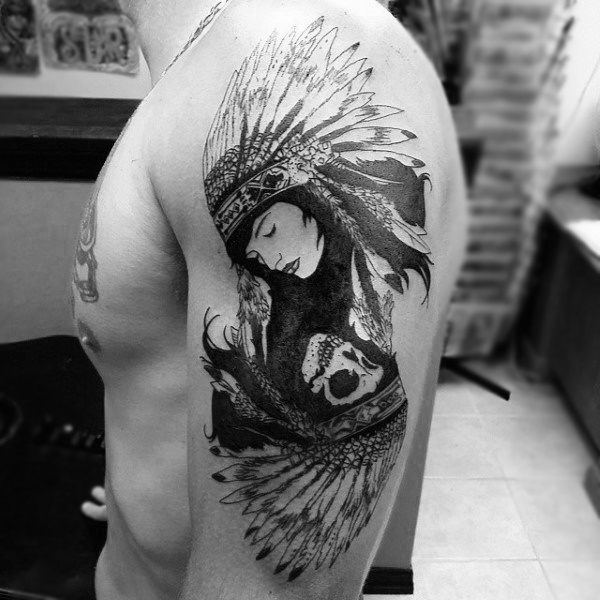 Outlines and small details can create a semi-realistic design such as the one below with the woman looking down upon the Indian skull figure. 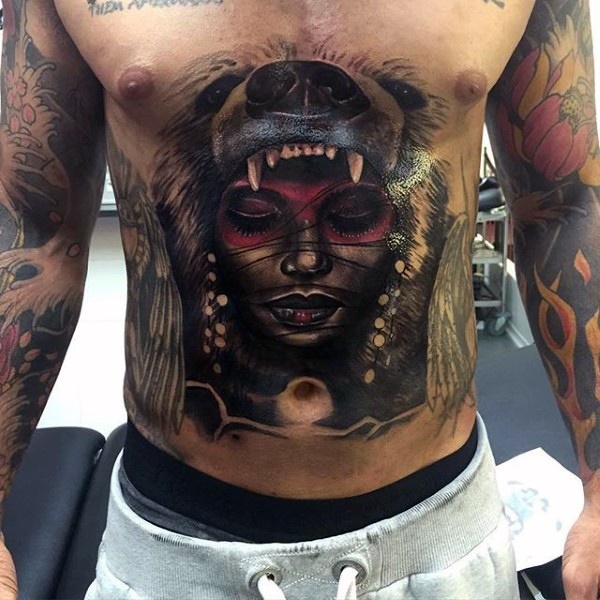 You may notice that some designs feature women with their faces painted and that each design of face paint will vary, and this is due to either celebration or other event where the design of the face paint will differ in meaning. 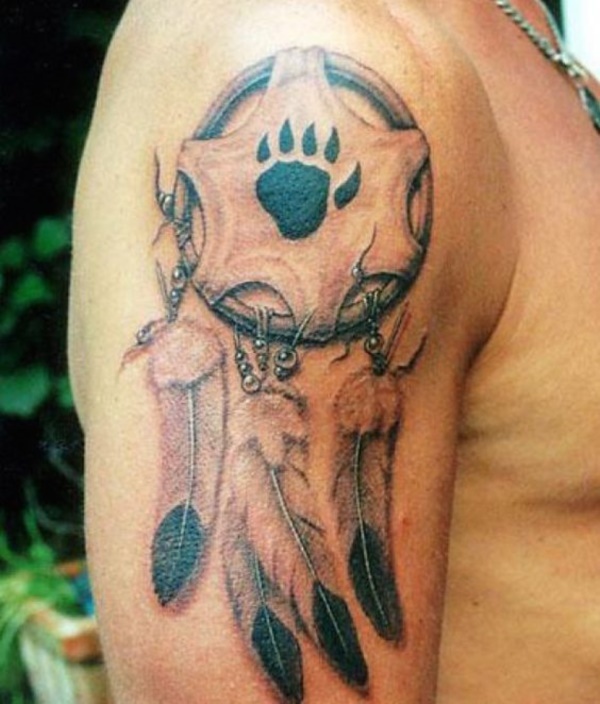 Dreamcatchers also vary in design as some possess animals in the center while others are more traditional. 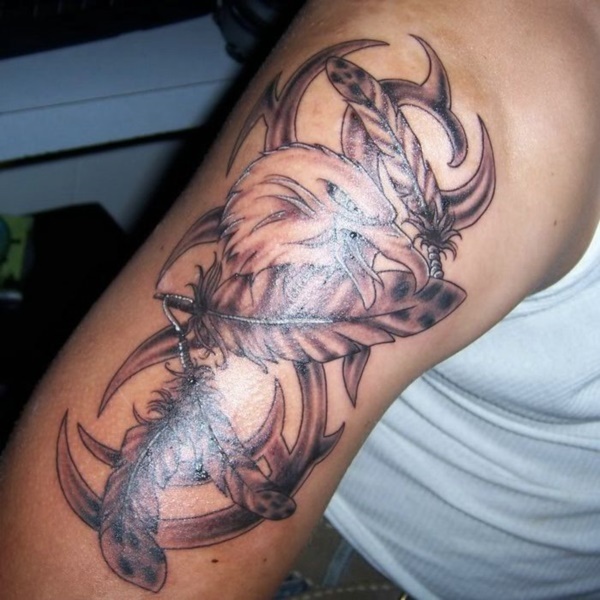 Articles of jewelry, including armbands, can also be tattooed on as they can be beautiful and intricate creations. 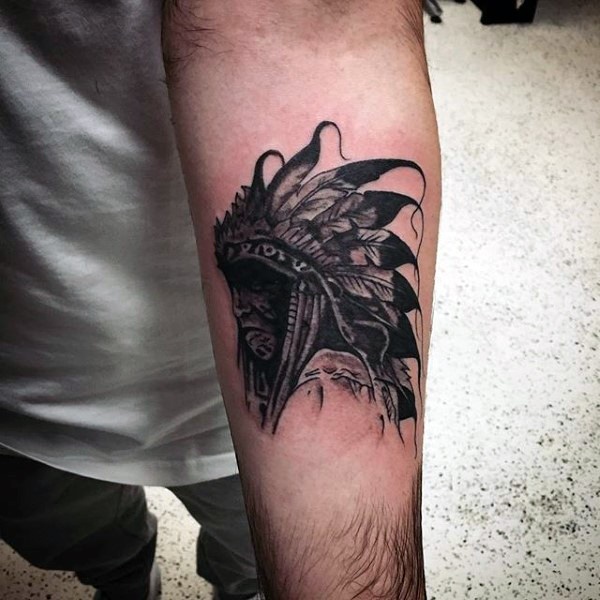 You will notice that many designs possess chiefs wearing headdresses, however, the designs of the headdress will usually vary from any other design. 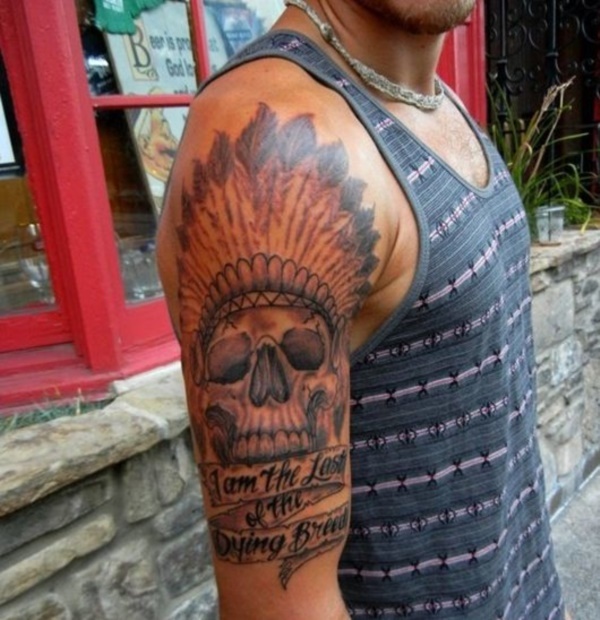 Some will combine Indian skull designs with various ribbons containing sayings or messages that the wearer finds important or meaningful. 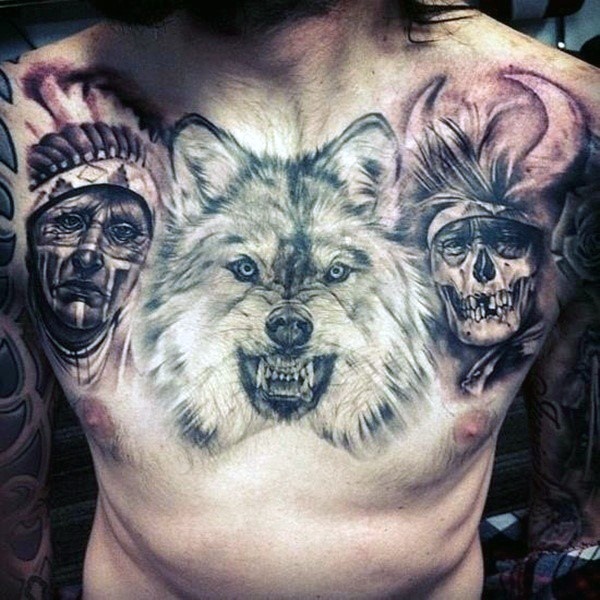 Wolves are another common inclusion when looking at Native American designs due to their strong appearance and wisdom. 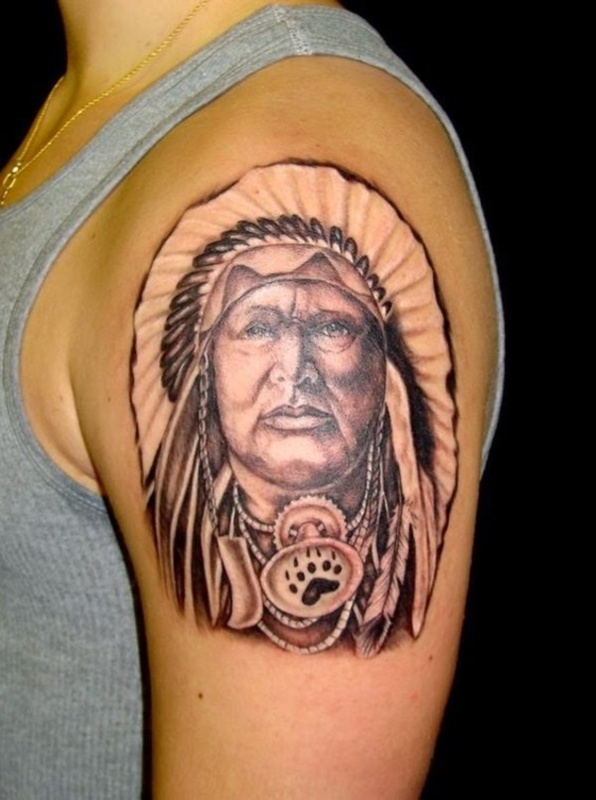 You may even find some Chief designs with large cats included like the image below. The colors used as well as the decorations included in a design may also help you narrow down a tribe if you are looking for more specifics. 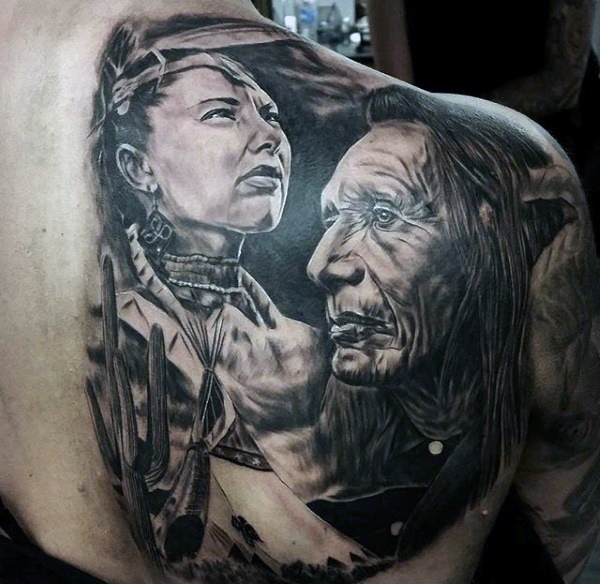 Most female Native American tattoos will possess a strength in the face of the woman that is portrayed. 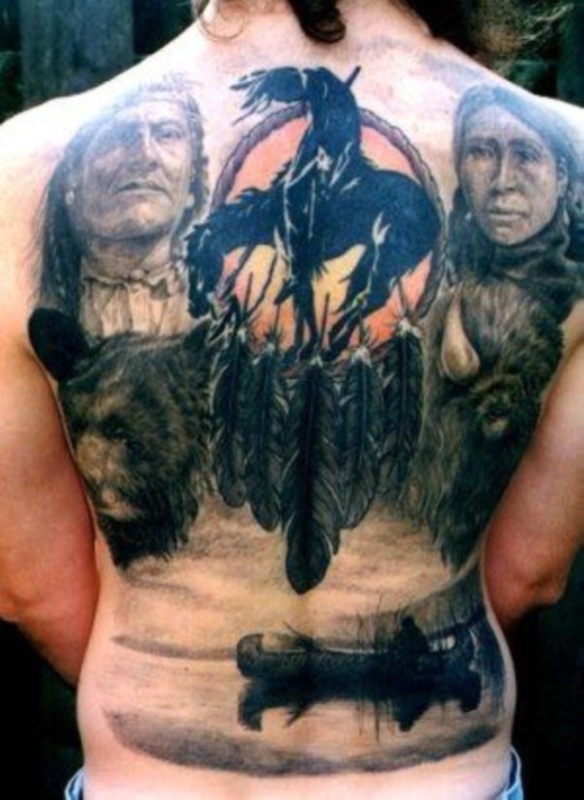 Some scenes even include multiple elements such as the Native Americans, dreamcatcher, and animals. 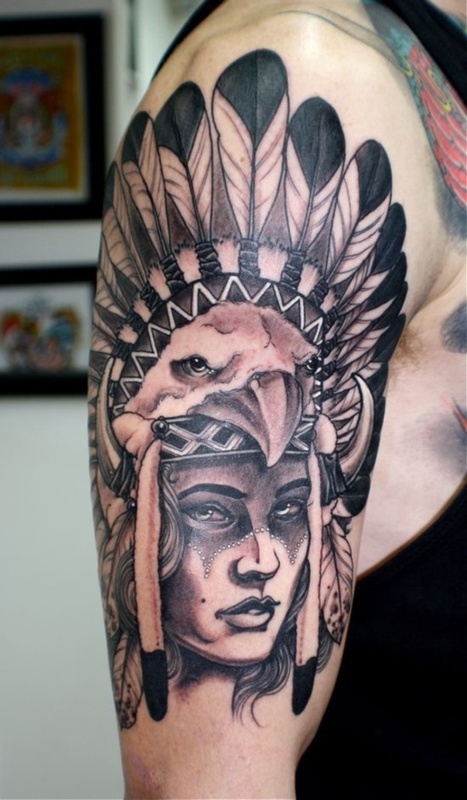 Another animal that may be included in a headdress includes that of the eagle due to their grace. If you are looking to include an animal but don’t want your design to become larger, consider adding in paw prints rather than the entire creature. 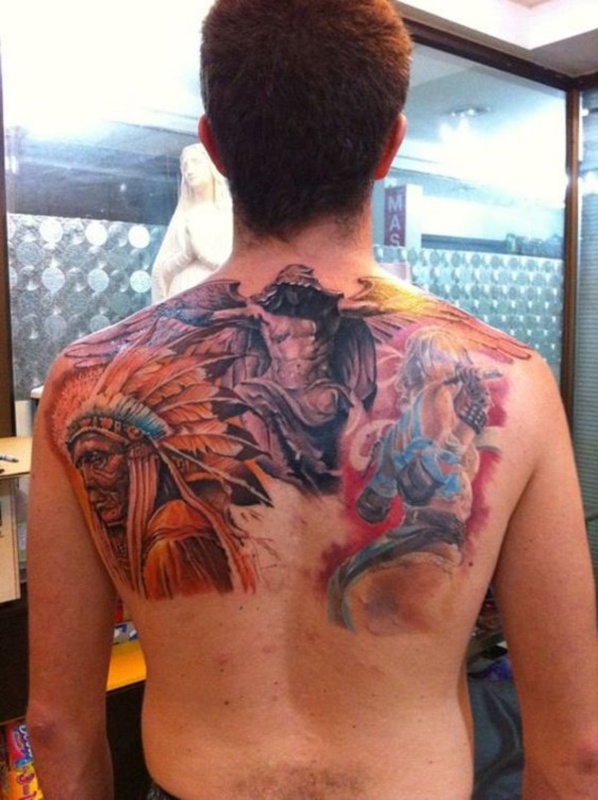 Some back pieces may include a scene while others choose a single element for their design. 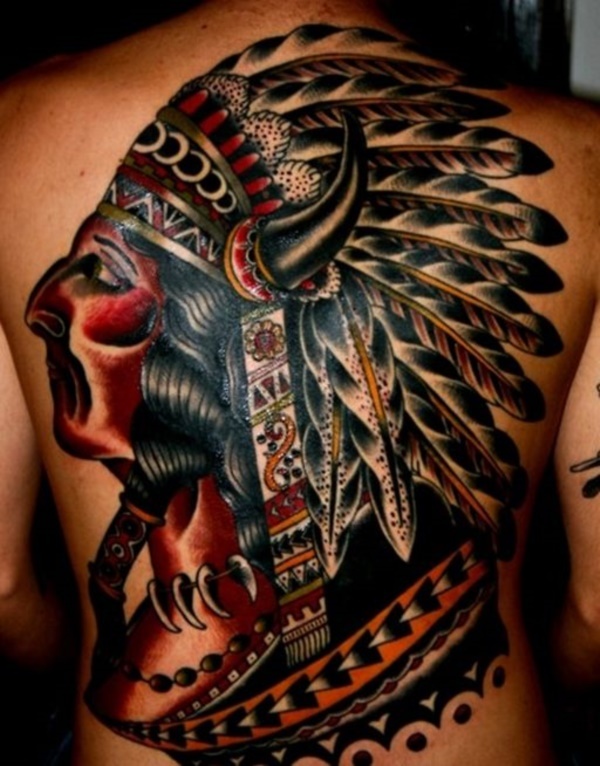 You may even find some with intricate headdress designs which are intricate and colorful. 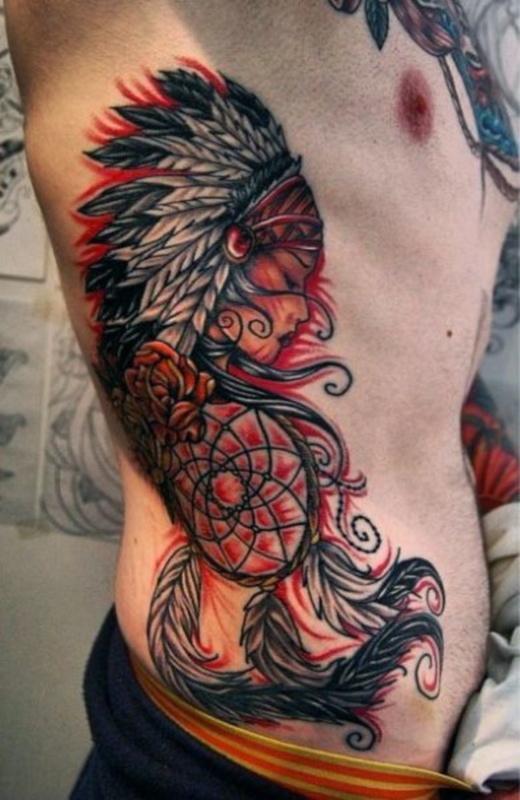 Others choose to combine elements such as a woman and a dreamcatcher because of the beauty that each design possesses.